Ten graduating seniors were honored as “cords of distinction” recipients in a ceremony held Saturday afternoon, April 27, 2013 at Eastern Mennonite University (EMU). Faculty, staff and fellow students nominated the recipients, who were cited for their “significant and verifiable impact” on the university and on student life; for their contributions to developing the institution’s positive image; for substantial contributions to the Harrisonburg/Rockingham County area and beyond; for their high academic and social standing; and their embodiment of EMU’s shared values of Christian discipleship, community, service and peacebuilding. 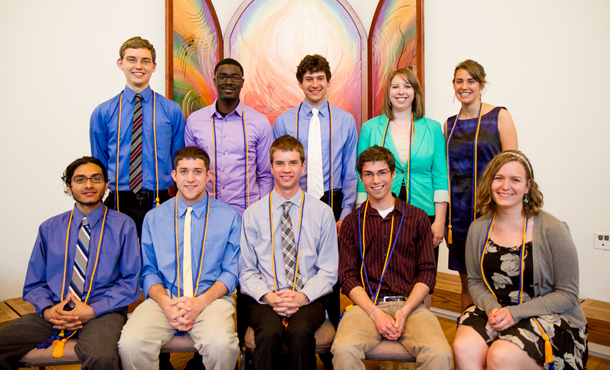 They wore gold and blue cords as they graduated on Sunday, April 28. Blue represents strength of conviction that one person can help to create a better institution or community. Gold represents the love of spirit and yearning toward creating a better university environment or community. Nels Akerson, a biology degree recipient from Harrisonburg, Va.
Michael Allen, a liberal arts degree recipient from Fork Union, Va.
Jossimar Diaz-Castro, a philosophy and theology degree recipient from Harrisonburg, Va.
Ryan Eshleman, a philosophy and theoogy and biology degree recipient from Harrisonburg, Va.
Darian Harnish, an accounting degree recipient from Manheim, Pa.
Josh Kanagy, a psychology degree recipient from Harrisonburg, Va.
Julia Schmidt, a history degree recipient from Pandora, Ohio. Hannah Schrock, a biology degree recipient from Kalona, Ia. Kelley Schroder, a music degree recipient from Leesburg, Va.
James Souder, an environmental sustainability degree recipient from Harrisonburg, Va.